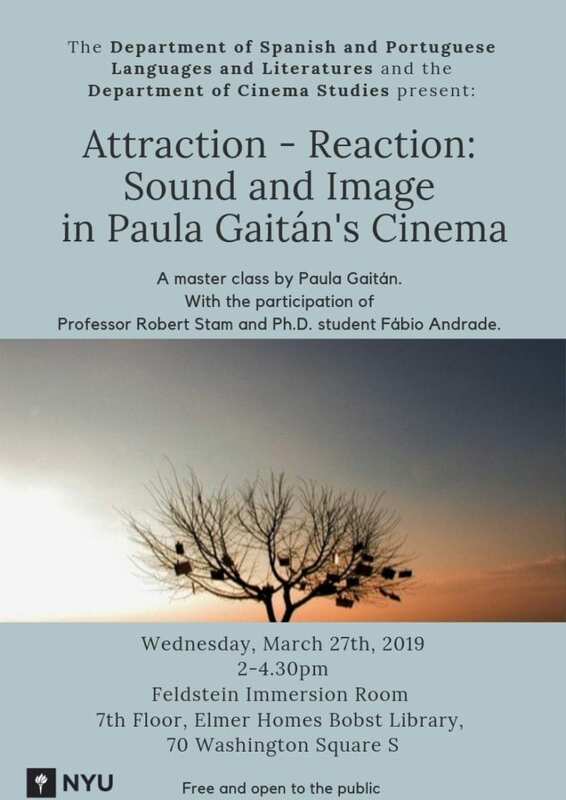 We are thrilled to be holding Attraction-Reaction: Sound and Image in Paula Gaitán’s Cinema, a masterclass by the great Colombian-Brazilian filmmaker Paula Gaitán at NYU tomorrow. The event is being organized by the Department of Spanish and Portuguese Language and Literature, and the Department of Cinema Studies, and it is free and open to all who RSVP. I’ve been lucky to work closely with Paula on her 2013 film The Volcano Exiles (Exilados do Vulcão), which won awards for best fiction feature film and best sound at Festival de Brasília do Cinema Brasileiro, and I’m happy to join her and professor Robert Stam in conversation tomorrow. On Thursday, Microscope Gallery will hold a rare 16mm free screening of her beautiful first film, Uaká (Sky, 1988), with the director in attendance. “Uaká/Sky leaves us with a sense of textures, colors, and rhythms, actions, gestures, and rituals that elude any one strategy for comprehension without ever suggesting that the events are incomprehensible or merely raw material for poetic expression”. — Bill Nichols, 1991. “The relaxed rhythm of montage and the constant soundtrack of ambient village chatter and music are examples of a form of cinematic evocation that coexists with discursive signification. Gaitan’s images, like Trinh Minh-ha’s, are aestheticized to produce a poetics of the other culture, suggesting the depth of all that remains unseen and unknown. The fragmentary style and refusal to explain or understand this culture banishes the scientism of ethnology.” — Catherine Russell, 1999.